My iMac and ChromeBook just hooked up. And I like it! My late-2009 model, 27-inch iMac has a bi-directional Mini DisplayPort jack in the back, so connecting another computer is a snap with the right cable. Newer iMacs use two way Thunderbolt cables not Mini DisplayPort wires. But can my iMac from Cupertino work with the lowly new kid on the block from Mountain View: A browser-based Google ChromeBook(s goog)? Indeed it can and this setup is already boosting my productivity. The best part? The 6-foot DisplayPort Male to Mini DisplayPort Male cable only cost me $6.57 on Amazon(s amzn). That’s a minuscule additional investment for me to get more out of both devices. The iMac now serves as both a powerful Mac for heavy duty computing needs as well as a display for my Samsung ChromeBook 550. So why would I even bother to do this when I can just use the more capable Mac for everything? As I showed in my first look of the new ChromeBook I bought, there’s something to be said for the simplicity of Google’s ChromeOS that even a Mac user can appreciate: It removes everything about traditional computing save the browser, which is super-speedy. This setup almost has Apple-like qualities, in fact: Simple but fast and effective. Here’s a look at the $450 device if you missed it earlier. I had been working with the ChromeBook as a traditional laptop, but with so many tabs open there are times when a little more real estate helps. Instead of a 12.1-inch 1280 x 800 display then, I now have a 27-inch palette running at its full 2560 by 1440 resolution. That offers me room to break out my Twitter client and my Rdio control panel for music while also having plenty of space for GTalk chats and my many browser tabs, for example. Text and images generally look a little better too. Don’t worry, my iMac will still get used as a Mac. When I cut videos, record podcasts or want to tinker in some apps or practice my Python scripting skills, I’ll use my iMac for sure. But while you’d think an iMac and ChromeBook would go together like oil and water, it turns out that less than $7 buys a cheap and happy date for the two devices. Disclosure: This post was completely written, edited and published on a ChromeBook paired with an iMac as monitor and worlds did not collide. Hello! I wonder how I can use that feature to input my iPad into my iPac (mid 2010 27″). Can’t find a mini-display port to dock connector. Thought of using a mini display to hdmi connector on iMac, a dock to hdmi connector on iPad and a hdmi cable in between, but found a post of someone who tried and it failed. They aren’t really communicating with one another; basically they are just sharing the same display. Some what like using a KVM switch without the K or M. Being able to move file from one to the other would really be communicating. That’s absolutely correct, Wayne; this post was about using the iMac as an external monitor for the Chromebook. You mentioned talking to Skype people on Google Talk via a bridge. How did you do that? The person I called uses bridging tech from Vidtel.com. Does the above mean that my early 2009 iMac, which has a MiniDisplay port, can be used to show the VGA output of my Linux box, using a MiniDisplay port to VGA adapter??!?! Because if it does, I do not have to use Display Sharing to access the Linux box screen and I can completely dump the Linux box monitor, which takes space on my desk. Unfortunately, John, I don’t think so. The bi-directional Mini DisplayPort jack appeared on the late 2009 iMac. I believe your model is one-way only, i.e. : it can only send video signals, not receive them. OK,not a big loss, but I still need to ask. If you do as suggested, do you just get another window on your desktop, showing the screen of the other computer? Just like that? Or are you using a special program? Many thanks for your time Kevin. John, for the ChromeBook, I simply get my Chrome OS desktop on a bigger display. 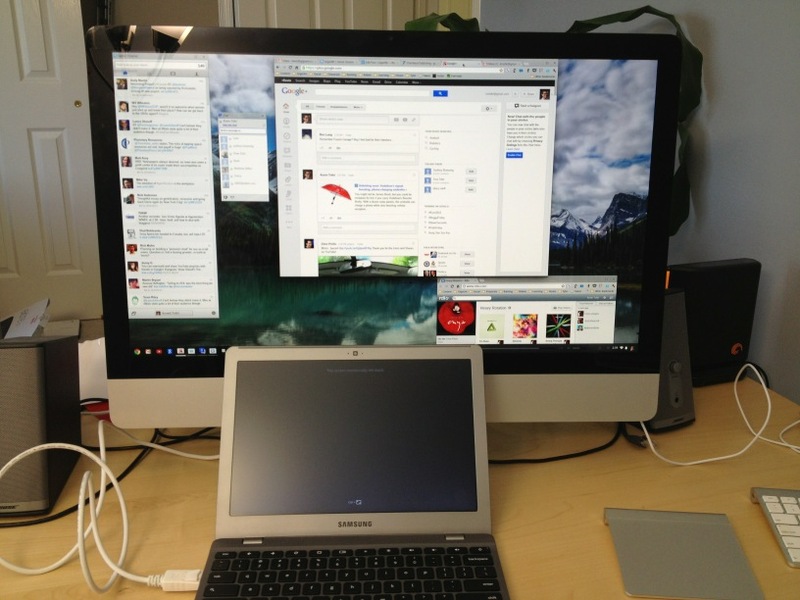 The ChromeBook monitor darkens; so this is just an external display solution. Google says that it’s working on using this setup (external monitor and ChromeBook) to have an extended Chrome OS desktop in the future. No special app here; just native Chrome OS, which of course, is Linux. OK on the Chrome OS Side, but what I am asking is on the OS-X side. Does the Chrome window just opens up in Mac OS, or are you using a special app for that to show it? My bad, John. I mis-understood. No, there’s no special program on the OS X side. Basically, the iMac is running OS X but showing it on the display. Press Command + F2 and you can switch between OS X and Chrome OS, i.e. : you can show one complete OS or another, but not both. For that situation, you’d likely want a VM app such as Fusion or Parallels. Thank you Kevin, your time is much appreciated. Happy to help where I can John. Thx! Check out chromeos builds from hexxeh. They update daily. You just unzip the img file and copy it to a mem stick. then you have a bootable chromeos stick that you can try on any machine… I keep the stick in my desk, and use it fairly often. Cntrol + Alt + t will give you a terminal window and you can install to the local hard drive here if you want. Great for shared access machines… I bought the chromebook for my Daughter who was going to be out of the country for a year. No problem if she loses it, or it is broken; all data on the cloud. I agree with the author on this one. I’m a long-time Mac fiend and the ChromeBook sounds appealing to me. I work a lot in Google Docs. I can see taking it and my iPad on trips. I wish Google would allow Chrome as a download. I’d love to check out the environment on my VMWare. I’m running Windows 8 there now – enough to know that it’s a dog. It started out as a pretty puppy but soon enough the prettiness wore off and all that’s left are the piles on the carpet. Interesting academic exercise, but I don’t get it. What’s so complicated about the MacOS for when all you want is a browser? Your browser button is sitting right on the dock. Boot, click Safari, and you have the same experience that you apparently crave. My old Chromebook was a dog, and I have no doubt that this will be as well. There are 2 types of data storage needs. Personal storage and cloud storage. Do you use your google account for all your docs, email, search and communication needs? Do you have a good desktop that you prefer to use for heavy computing needs for your job, hobbies or gaming? Do you never need these heavy programs with you when you’re not in your home or office space but want a laptop instead of a tablet? You will find a chromebook very useful. Chromebooks aren’t made for people looking to use their laptop as there primary computing and storage device. It’s a niche device for those who need a stable, virus free, simple and intuitive access to their cloud data without the clumsy gotta-touch-and-peck-letters interface that a tablet sports. And without spending $1200 on computer of the same platform. However, it may be true that google’s price-point is a bit off. $100 reduction in price would feel much more reasonable. Samsung makes quality gear. I doubt it will need to be replaced for at least 5 years. an average of about $1000 that is the difference. Except this demonstration required an iMac! He was showing how you can use your iMac as a means of simplified computing. But the iMac is already simplified! This is like going camping to prove that you can survive in the wild, while camping in your backyard. No, he was showing how you can use your iMac with your chromebook to augment productivity through 2 simple platforms. Not to create simplicity. Can’t you just load Chrome into Parallels and skip all the fancy stuff? Well, I wouldn’t call a $6.57 cable “fancy stuff” considering it’s less expensive than Parallels, but sure. ;) I also thought Google doesn’t offer the Chrome OS for download/installation on other hardware or in a virtual machine or do you mean to use an image created by an enthusiast or developer site? Nice! I didn’t realize they struck a deal with Google to get Chrome OS in a VM but it looks like they did. I think that will give people the feel for Chrome OS, of course (much like using Chrome on a Mac natively) but I still don’t think it’s quite the same: There’s something to be said for hardware that does nothing but run Chrome OS. :) Still, that’s a nice find! Can’t you just load Chrome into Paralles and skip all the fancy stuff? If the rowboat could actually pull the aircraft carrier that actually would be pretty great. I keep hearing how good the Chromebook can be as a productivity device. Now I just need to wait a couple months for a bunch to flood eBay from people that didn’t understand what they were buying.